Thinking of making a comic book out of your artwork (or even photos), and want to give each piece a genuine comic book look-and-feel? Or maybe you’d like make a calendar with a gritty or grunge vibe? Using a few simple steps below you can approximate the print style of old comic books. The steps are derived from Adobe Photoshop CS5, but are similar for earlier versions. Open your photo or artwork in Photoshop CS5. (Always keep a backup of your original!) The image can start out at any size, however once the technique has been applied, you can downsize it as needed. Choose Layer -> Duplicate Layer. Under Destination, choose New and then enter a name (i.e., “Halftone.”) This creates a duplicate of your image in a new document, which automatically becomes the frontmost window. Choose Image -> Mode -> Grayscale. You’ll be asked to confirm you want to discard color information; to continue, click Discard. Choose Image -> mode -> Bitmap. You’re asked to set the output resolution and the conversion method. Enter an output resolution that is four times the input resolution (i.e., if the input is 72 pixels per inch, enter 288.) 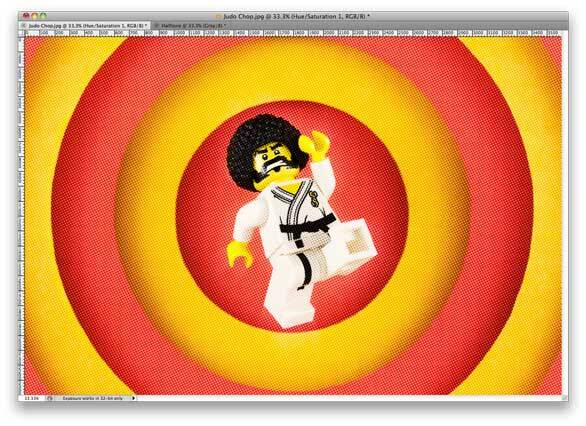 Now choose Halftone Screen from the Method pop-up menu, and then click OK. It may take some trial and error to find the right frequency—just undo the conversion and try again. You must now configure the halftone screen. The frequency determines how many halftone lines (or in this case, dots) you’ll have per inch. It can take some trial and error to get just right, so to start, enter 6. Now specify an angle of 60°, choose Round from the Shape pop-up menu, and click OK. If the dots seem too tiny, you’ll need to redo the conversion and enter a lower frequency; if the dots seem too large, you’ll need to retry the conversion with a higher frequency. Choose Edit -> Undo Bitmap and then Image -> Mode -> Bitmap to redo the conversion until you’re satisfied. Choose Layer -> Duplicate Layer. Enter “Comic Overlay” as the layer name and then, under Destination, choose the original image from the Document pop-up menu. Click OK to continue. Return to your original document by clicking its tab. The black and white halftone will be obscuring the original image, but we’ll fix that now. Choose Window -> Layers (if necessary) to view the Layer panel. Click the layer called Comic Overlay to select it (if it is not already selected), and then choose Layer -> Layer Style -> Blending Options. Under General Blending, choose Soft Light. Instantly, the color will return to your photo and it will have that comic book look-and-feel. Click OK to continue. You can fine-tune the look of your image in a number of ways. You can lessen the effect by adjusting the layer opacity, which you can do in either the top right of the Layers panel, or via Layer -> Layer Style -> Blending Options. Alternatively, you can soften the entire effect by blurring the halftone layer. With Comic Overlay selected, choose Filter -> Blur -> Gaussian Blur, enter a value between 2.0 and 5.0, and then click OK.
Once the effect is applied, the photo will appear to have a traditional halftone print pattern across it. That’s it! Once you’ve found just the right look for your photo, flatten the image by choosing Layer -> Flatten Image. Now just save your file and pop it into a calendar you’re constructing in iPhoto, or a comic book you’re creating with Plasq’s Comic Life! Chris McVeigh is an author, illustrator and toy photographer who lives in Halifax, Nova Scotia.